I made more dumplings again yesterday and resolved to use some good quality ingredients. I headed to City Super, a high-end supermarket that specializes mostly in Japanese ingredients. Originally I was only going to get the wrappers because they are refrigerated -- the other supermarkets I have visited put the wrappers in the freezer for some reason. Once they defrost, they are surely soggy? And I've tried the wrappers in the wet market, but they are on the thick side. At the wet market I bought chives, mushrooms and ginger. 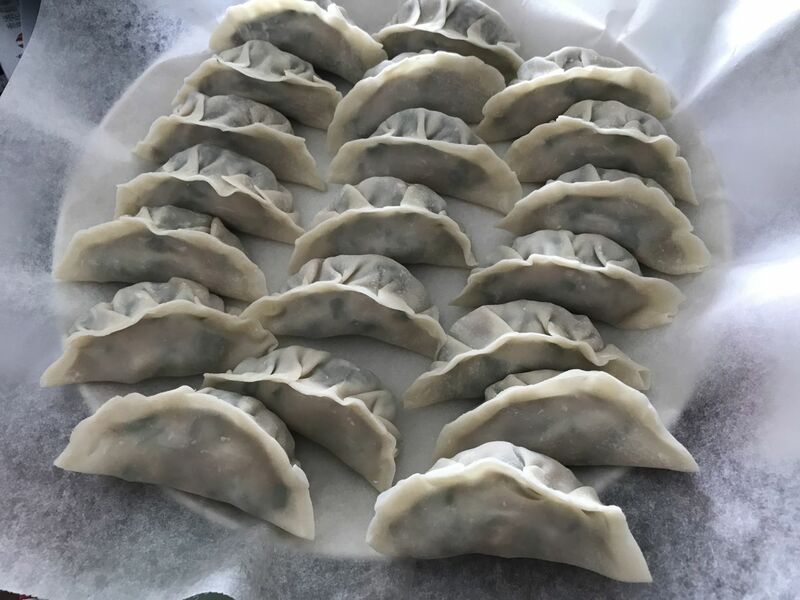 It turns out over 750 grams of pork, mixed with chives and finely chopped mushrooms and grated garlic are enough to make 60 dumplings. I followed my mother's instructions and after making four of them I boiled two to check the taste. The pork was on the very lean side (ie not much taste), and unfortunately I ran out of sesame oil so I added more olive oil and Shaoxing wine for flavour. This time I endeavored to try another method of wrapping them and watched a few YouTube videos to get the gist of how to wrap them in different ways. In the end I settled on making pleats on one side much like gyoza. The wrappers I bought were quite thin so my wrapping wasn't very even, but improved as I went along. I can't wait to make another batch of dumplings again -- this time with a bit more fattier pork -- because I still have another 60 wrappers in the refrigerator!